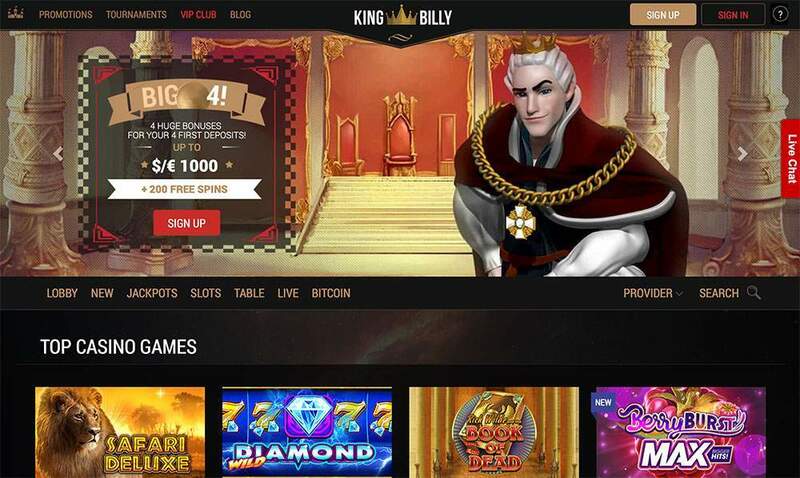 King Billy Casino is an online casino that offers a massive amount of different online slots and casino games, from a variety of leading gaming platforms. These include NetEnt, Microgaming, BetSoft, iSoftBet, Endorphina, and many other software providers. The casino website is available in English, Swedish, Greek and Russian. King Billy Casino is licensed and regulated by the laws of Curacao. 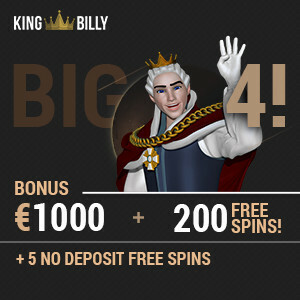 At King Billy there are 4 huge welcome bonuses waiting for you. € 1000 BONUS + 200 FREE SPINS! Big 4 means bigger, better and bolder bonuses for your deposits! Start now and start big! Free Spins will be given in the following way: 20 Free Spins will be credited to the player’s account every day, for a period of 10 days. The first set of Free Spins will be added to the player’s account after the player has fulfilled the wagering requirements: 1x wager of deposit’s amount in 23 hours. Make sure your read the Terms and Conditions before you start playing! Slot lovers can enjoy a wide diversity of titles at King Billy Casino. The selection features numerous video slots including Easter Island, Book of Dead, Pink Elephants, Wonky Wabbits, Valley of the Gods, and Gold King. Furthermore, the site is a home to some of the most popular progressive slots, like Divine Fortune slot and The Slotfather Slot. The table games collection is also diverse enough. Roulette fans can master the wheel with alternatives like American Roulette, European Roulette and French Roulette. Blackjack enthusiasts can play Single Deck Blackjack, Blackjack Surrender and Blackjack Classic Touch alongside other variants. Also, there is Baccarat Zero Commission. Poker games assortment offers a number of options like Caribbean Poker, Casino Hold’em, Let it Ride, Oasis Poker, Texas Hold’em and Trey Poker. In case of having any issues, players may contact King Billy Casino support via email or live chat. In addition, there’s a useful FAQ section, which contains answers to previously asked questions. What’s more, the support may be reached via social media channels on Facebook, YouTube and Instagram. Players at King Billy Casino can rest assured that their personal and financial information is kept confidential, as the entire website is protected by the SSL encryption. All games at King Billy Casino are audited by trusted third-party agencies, like iTech Labs. These audits can easily be found on King Billy Casino’s software providers’ websites. Payment Methods: VISA, MasterCard, Sofort, SEB, Swedbank, Astropay, iDEAL, iDebit, Interac, Instadebit, Skrill, Ecopayz, Neteller, Paysafecard, Zimpler, Giropay, Neosurf, Yandex.Money, Alfa Click, QIWI, BTC. Withdrawal Methods: VISA, MasterCard, Skrill, Neteller, Ecopayz, iDebit, Interac, BTC, Yandex.Money, QIWI, Bank Transfer. There are several country restrictions at King Billy Casino. In particular, players residing in Estonia, France, the Netherlands, Romania, Spain, Ukraine, Israel, the United Kingdom, the US or any of its states, will not be able to open an account or bet with real money. King Billy casino carries our reward of excellence seal that is only awarded to online casinos that meet our standards with an average of 8/10 or higher. With this seal we also state that King Billy is a fully trustworthy casino with a good service for its players.